Myoepithelial cells are seen in many secretory organs including salivary glands, where they are usually encountered in the acini and intercalated ducts (see the image below). These cells express a dual epithelial and smooth muscle phenotype and are likely of ectodermal origin. 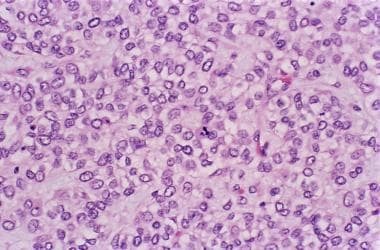 [1, 2] Their neoplastic biologic behavior in many salivary gland tumors, unpredictable at times, has and is still being characterized either as a major component of myoepithelial entities or as one of the components of many salivary gland tumors (eg, pleomorphic adenoma, adenoid cystic carcinomas). A photomicrograph of a myoepithelioma. The upper, right corner shows a well-defined margin of the lesion. Myoepithelioma was recognized as a histologically distinct entity by the World Health Organization (WHO) in 1991. It is a benign salivary gland tumor that consists entirely of myoepithelial cells with variable cellular morphologies including spindle, epithelioid, plasmacytoid, or clear cells. A myoepithelioma can be composed of one or a mixture of those cell types, and a variable stromal component can be seen in these tumors. Among investigators, the level of "tolerance" for the presence of epithelial ductal elements in a myoepithelioma is variable and controversial (see Microscopic Findings). To date, more than 200 cases have been reported. Myoepitheliomas are also known as myoepithelial adenoma or benign myoepithelial tumors. No clear etiologic factor has been identified for myoepitheliomas. Although myoepitheliomas have been reported in all major and most locations containing the minor salivary glands, [18, 19] the parotid gland is the primary site of occurrence of most reported tumors (40-50%), [8, 11] followed by the minor salivary glands as the second most preferred site (of which the palate is the most common location [21%]). [7, 11, 12, 14] The submandibular gland accounts for 10% of the tumors. Myoepitheliomas present as a slowly growing, painless tumor mass. No cases in the parotid have been reported to be accompanied by facial nerve weakness, and those occurring in the palate rarely ulcerate. As the tumor has been reported in variable head and neck locations, the symptoms will vary accordingly. Myoepitheliomas are well-circumscribed, gray-white/tan/yellow, solid masses (average, 3-5 cm) with a smooth outline. [7, 14, 21] Degenerative changes are usually not a feature. Tumors arising in the parotid gland are usually encapsulated, in contrast to those arising in other major glands (submandibular and sublingual) or the minor salivary glands, which tend to lack a capsule or only have a partial capsule but are invariably well circumscribed. Myoepithelial cells exhibit 4 main cell morphologies: spindle (most common), epithelioid, plasmacytoid, and clear cells (least common). A mixture of these subtypes may be present in one tumor. Spindle cell myoepitheliomas have central fusiform/cigar-shaped nuclei, eosinophilic cytoplasm, and tapered ends and are usually arranged in interlacing fascicles (see the following image). Spindle cell myoepithelioma. Note the cigar-shaped nuclei and the streaming fascicular pattern. 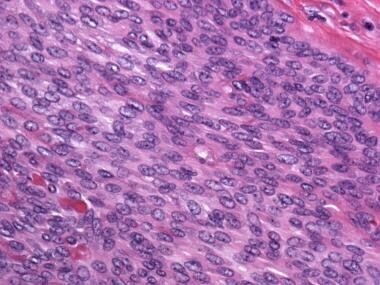 Epithelioid myoepithelioma. Note the epithelioid cells with large centrally located nuclei and amphophilic/eosinophilic cytoplasm, and that there are focal areas of clearing in the cytoplasm. 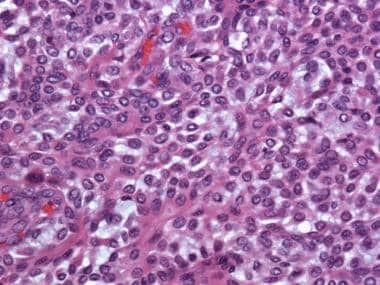 Plasmacytoid cell myoepitheliomas have round to ovoid cells with abundant eosinophilic cytoplasm and eccentrically located nuclei (see the following image). The cells tend to be discohesive and occur mainly in aggregates in abundant mucoid stroma. Plasmacytoid myoepithelioma. Note the plasmacytoid cells with ample eosinophilic cytoplasm and an eccentrically located nuclei. The plasmacytoid cell type is particularly encountered in palatal myoepitheliomas and has been the subject of some controversy that is largely due to its low level or complete absence of of expression of myogenic markers. Some authors have doubted their identification as myoepitheliomas, [23, 24] even suggesting that these tumors should be classified as adenomas or plasmacytoid adenocarcinomas. Other authors believe that the low expression of muscle tissue markers should still qualify them as myoepitheliomas  and that plasmacytoid cells may represent, with the other morphologic myoepithelial cell types, different stages of evolution in myoepitheliomas. Electron microscopic evidence suggests a myoepithelial origin for these cells (see the Electron microscopy examination section, below). Clear cell myoepitheliomas, the rarest kind, have polygonal cells with clear cytoplasm (due to glycogen content) (see the following image). Sometimes the clear cells can exhibit a signet ringlike or lipoblastlike appearance. Microcystic spaces containing amphorous material can be seen in clear cell myoepitheliomas, however, these features are also seen, albeit less frequently, with other cell types. 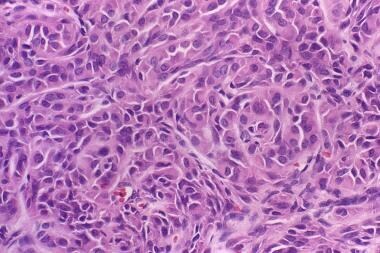 When considering the diagnosis of clear cell myoepithelioma, it is important to remember that many salivary gland tumors and metastatic tumors to the salivary glands can exhibit clear cell morphology. Clear cell myoepithelioma. Note the clear nature of the cytoplasm in this rare form of myoepithelioma. Foci of oncocytic differentiation/metaplasia may also be seen in clear cell myoepitheliomas, and on occasion, these features can predominate in the tumor. Occasionally, the oncocytic nuclear pleomorphism, enlargement, and hyperchromasia can be concerning, but these have not been found to necessarily correlate with malignant change. Different architectural patterns including trabecular, nested, or solid may be seen. 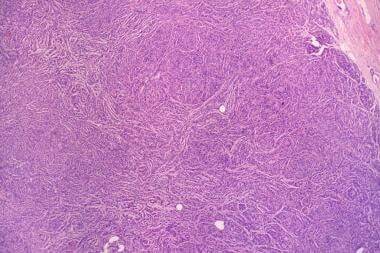 An unusual reticular pattern variant have been reported by Dardick et al, [12, 28] in which narrow, interconnected cords of tumor cells in a netlike fashion are seen surrounded by abundant mucoid stroma or loose vascularized stroma. Myxoid stroma is particularly abundant in this myoepithelioma, which shows a predominantly spindle cell morphology. 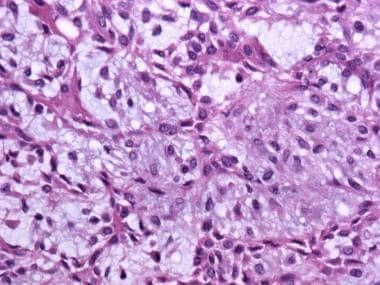 It is important to point out that some myoepithelial carcinomas can present with a very bland cell morphology that may defy the clinical impression of malignancy and make identifying a myoepithelial carcinoma a difficult task histologically, particularly on limited biopsies. Observation of the infiltrative pattern, focal necrosis, perineural invasion among other malignant indices may be the only clue to malignant change in a seemingly bland myoepithelioma,  a task that may only be possible on careful evaluation of the resected tumor. It is of interest that examination of the plasmacytoid cell types by electron microscopy in many studies showed the same fibrillar type as the spindle cell type; however, the fibrils in the plasmacytoid cel types were more disorganized  and did not exhibit focal densities as seen in spindle cells. In all other ways, however, there was homology of the ultrastructure of both cell types. Cutaneous and soft-tissue myoepitheliomas rarely occur in the head and neck region [25, 30, 37] as well as in the lacrimal gland region  and should be differentiated from those of salivary gland origin. Fortunately, many such confirmations can be resolved by using a combination of these markers. Usually, a combination of a keratin in conjunction with the detection of S-100, vimentin, and/or a myogenic marker is required for confirmation of the diagnosis of a myoepithelioma. Batsakis JG. Myoepithelioma. Ann Otol Rhinol Laryngol. 1985 Sep-Oct. 94(5 pt 1):523-4. [Medline]. Sheldon WH. So-called mixed tumors of the salivary glands. Arch Pathol. 1943. 35:1-20. Bauer WH, Fox RA. Adenomyoepithelioma (cylindroma) of palatal mucous glands. Arch Pathol. 1945. 39:96-102. Bhaskar SN, Weinmann JP. Tumors of the minor salivary glands: a study of twenty-three cases. Oral Surg Oral Med Oral Pathol. 1955 Dec. 8(12):1278-97. [Medline]. Seifert G, Sobin LH. Myoepithelioma. World Health Organization International Histological Classification of Tumours: Histological Typing of Salivary Gland Tumours. 2nd ed. Berlin, Germany: Springer-Verlag; 1991. 20-1. Sciubba JJ, Brannon RB. Myoepithelioma of salivary glands: report of 23 cases. Cancer. 1982 Feb 1. 49(3):562-72. [Medline]. Barnes L, Appel BN, Perez H, El-Attar AM. Myoepithelioma of the head and neck: case report and review. J Surg Oncol. 1985 Jan. 28(1):21-8. [Medline]. Chen L, Ray N, He H, Hoschar A. Cytopathologic analysis of stroma-poor salivary gland epithelial/myoepithelial neoplasms on fine needle aspiration. Acta Cytol. 2012. 56(1):25-33. [Medline]. Matsuyama A, Hisaoka M, Hashimoto H. PLAG1 expression in mesenchymal tumors: an immunohistochemical study with special emphasis on the pathogenetical distinction between soft tissue myoepithelioma and pleomorphic adenoma of the salivary gland. Pathol Int. 2012 Jan. 62(1):1-7. [Medline]. Ellis GL, Auclair PL. Myoepithelioma. Atlas of Tumor Pathology: Tumors of the Salivary Glands. 3rd ed. Washington, DC: Armed Forces Institute of Pathology; 1996. 57-68. Dardick I, Thomas MJ, van Nostrand AW. Myoepithelioma--new concepts of histology and classification: a light and electron microscopic study. Ultrastruct Pathol. 1989 Mar-Jun. 13(2-3):187-224. [Medline]. Kawashima Y, Kobayashi D, Ishikawa N, Kishimoto S. A case of myoepithelioma arising in an accessory parotid gland. J Laryngol Otol. 2002 Jun. 116(6):474-6. [Medline]. Alos L, Cardesa A, Bombí JA, Mallofre C, Cuchi A, Traserra J. Myoepithelial tumors of salivary glands: a clinicopathologic, immunohistochemical, ultrastructural, and flow-cytometric study. Semin Diagn Pathol. 1996 May. 13(2):138-47. [Medline]. Cuadra Zelaya F, Quezada Rivera D, Tapia Vazquez JL, Paez Valencia C, Gaitán Cepeda LA. Plasmacytoid myoepithelioma of the palate. Report of one case and review of the literature. Med Oral Patol Oral Cir Bucal. 2007 Dec 1. 12(8):E552-5. [Medline]. Dardick I, van Nostrand AW. Myoepithelial cells in salivary gland tumors--revisited. Head Neck Surg. 1985 May-Jun. 7(5):395-408. [Medline]. Lins JE, Gnepp DR. Myoepithelioma of the palate in a child. Int J Pediatr Otorhinolaryngol. 1986 Feb. 11(1):5-13. [Medline]. Sayed SI, Kazi RA, Jagade MV, Palav RS, Shinde VV, Pawar PV. A rare myoepithelioma of the sinonasal cavity: case report. Cases J. 2008 Jul 11. 1(1):29. [Medline]. [Full Text]. Gaio E, Perasole A, Bagatella F. Bilateral myoepithelioma of the nasopharynx: a case report. Auris Nasus Larynx. 2009 Aug. 36(4):496-500. [Medline]. Politi M, Toro C, Zerman N, Mariuzzi L, Robiony M. Myoepithelioma of the parotid gland: Case report and review of literature. Oral Oncology Extra. July 2005. 41(6):104-8. [Full Text]. Simpson RH, Jones H, Beasley P. Benign myoepithelioma of the salivary glands: a true entity?. Histopathology. 1995 Jul. 27(1):1-9. [Medline]. Savera AT, Sloman A, Huvos AG, Klimstra DS. Myoepithelial carcinoma of the salivary glands: a clinicopathologic study of 25 patients. Am J Surg Pathol. 2000 Jun. 24(6):761-74. [Medline]. Franquemont DW, Mills SE. Plasmacytoid monomorphic adenoma of salivary glands. Absence of myogenous differentiation and comparison to spindle cell myoepithelioma. Am J Surg Pathol. 1993 Feb. 17(2):146-53. [Medline]. Ogawa Y, Kishino M, Atsumi Y, et al. Plasmacytoid cells in salivary-gland pleomorphic adenomas: evidence of luminal cell differentiation. Virchows Arch. 2003 Nov. 443(5):625-34. [Medline]. Hornick JL, Fletcher CD. Cutaneous myoepithelioma: a clinicopathologic and immunohistochemical study of 14 cases. Hum Pathol. 2004 Jan. 35(1):14-24. [Medline]. da Silveira EJ, Pereira AL, Fontora MC, de Souza LB, de Almeida Freitas R. Myoepithelioma of minor salivary gland--an immunohistochemical analysis of four cases. Braz J Otorhinolaryngol. 2006 Jul-Aug. 72(4):528-32. [Medline]. Skalova A, Michal M, Ryska A, et al. Oncocytic myoepithelioma and pleomorphic adenoma of the salivary glands. Virchows Arch. 1999 Jun. 434(6):537-46. [Medline]. Dardick I, Cavell S, Boivin M, et al. Salivary gland myoepithelioma variants. Histological, ultrastructural, and immunocytological features. Virchows Arch A Pathol Anat Histopathol. 1989. 416(1):25-42. [Medline]. Dardick I. Myoepithelioma: definitions and diagnostic criteria. Ultrastruct Pathol. 1995 Sep-Oct. 19(5):335-45. [Medline]. Hornick JL, Fletcher CD. Myoepithelial tumors of soft tissue: a clinicopathologic and immunohistochemical study of 101 cases with evaluation of prognostic parameters. Am J Surg Pathol. 2003 Sep. 27(9):1183-96. [Medline]. Nayak JV, Molina JT, Smith JC, Branstetter BF 4th, Hunt JL, Snyderman CH. Myoepithelial neoplasia of the submandibular gland: case report and therapeutic considerations. Arch Otolaryngol Head Neck Surg. 2003 Mar. 129(3):359-62. [Medline]. Leifer C, Miller AS, Putong PB, Harwick RD. Myoepithelioma of the parotid gland. Arch Pathol. 1974 Nov. 98(5):312-9. [Medline]. Alos L, Cardesa A, Bombi JA, Mallofre C, Cuchi A, Traserra J. Myoepithelial tumors of salivary glands: a clinicopathologic, immunohistochemical, ultrastructural, and flow-cytometric study. Semin Diagn Pathol. 1996 May. 13(2):138-47. [Medline]. Takai Y, Mori M, Dardick I, et al. Myofilament localization and immunoelectron microscopic detection of muscle-specific actin in neoplastic myoepithelial cells in pleomorphic adenomas and myoepitheliomas. Ultrastruct Pathol. 1994 Nov-Dec. 18(6):575-91. [Medline]. Romero-Guadarrama MB, Alonso de Ruiz P, Cruz-Ortiz H, Rodriguez-Martinez HA. Salivary gland myoepitheliomas: cytological, histological, immunohistochemical and electromicroscopical studies of four cases. Rev Med Hosp Gen Mex. 2001. 64(3):147-51. Herlihy EP, Rubin BP, Jian-Amadi A. Primary myoepithelioma of the orbit in an infant. J AAPOS. 2009 Jun. 13(3):303-5. [Medline]. Bolzoni A, Pianta L, Farina D, Nicolai P. Benign myoepithelioma of the lacrimal gland: report of a case. Eur Arch Otorhinolaryngol. 2005 Mar. 262(3):186-8. [Medline]. Cardesa A, Alos L. Myoepithelioma. Barnes L, Eveson JW, Reichart P, Sidransky D, eds. World Health Organization Classification of Tumours: Pathology and Genetics of Head and Neck Tumours. Lyon, France: IARC Press; 2005. 259-60. Savera AT, Gown AM, Zarbo RJ. Immunolocalization of three novel smooth muscle-specific proteins in salivary gland pleomorphic adenoma: assessment of the morphogenetic role of myoepithelium. Mod Pathol. 1997 Nov. 10(11):1093-100. [Medline]. Nagao T, Sugano I, Ishida Y, et al. Salivary gland malignant myoepithelioma: a clinicopathologic and immunohistochemical study of ten cases. Cancer. 1998 Oct 1. 83(7):1292-9. [Medline]. Prabhu S, Kaveri H, Rekha K. Benign; malignant salivary gland tumors: comparison of immunohistochemical expression of e-cadherin. Oral Oncol. 2009 Jul. 45(7):594-9. [Medline]. de Araujo VC, Carvalho YR, de Araujo NS. Actin versus vimentin in myoepithelial cells of salivary gland tumors. A comparative study. Oral Surg Oral Med Oral Pathol. 1994 Apr. 77(4):387-91. [Medline]. el-Naggar AK, Lovell M, Callender DL, Ordonez NG, Killary AM. Cytogenetic analysis of a primary salivary gland myoepithelioma. Cancer Genet Cytogenet. 1999 Aug. 113(1):49-53. [Medline]. Hungermann D, Roeser K, Buerger H, Jakel T, Loning T, Herbst H. Relative paucity of gross genetic alterations in myoepitheliomas and myoepithelial carcinomas of salivary glands. J Pathol. 2002 Dec. 198(4):487-94. [Medline]. Weber A, Langhanki L, Schutz A, et al. Expression profiles of p53, p63, and p73 in benign salivary gland tumors. Virchows Arch. 2002 Nov. 441(5):428-36. [Medline]. Vekony H, Roser K, Loning T, et al. Deregulated expression of p16INK4a and p53 pathway members in benign and malignant myoepithelial tumours of the salivary glands. Histopathology. 2008 Dec. 53(6):658-66. [Medline]. Skálová A, Weinreb I, Hyrcza M, Simpson RH, Laco J, Agaimy A, et al. Clear Cell Myoepithelial Carcinoma of Salivary Glands Showing EWSR1 Rearrangement: Molecular Analysis of 94 Salivary Gland Carcinomas With Prominent Clear Cell Component. Am J Surg Pathol. 2015 Mar. 39(3):338-48. [Medline]. Flucke U, Tops BB, Verdijk MA, van Cleef PJ, van Zwam PH, Slootweg PJ, et al. NR4A3 rearrangement reliably distinguishes between the clinicopathologically overlapping entities myoepithelial carcinoma of soft tissue and cellular extraskeletal myxoid chondrosarcoma. Virchows Arch. 2012 Jun. 460(6):621-8. [Medline]. [Full Text]. Ide F, Mishima K, Kikuchi K, Miyazaki Y, Kusama K. Primary intraosseous myoepithelioma of the mandible with ameloblastomalike features. Oral Surg Oral Med Oral Pathol Oral Radiol. 2012 Mar 30. [Medline]. Suguna BV, Geethamani V, Niveditha SR, Monika LS. Malignant myoepithelioma of the breast: case report with review of literature. Malays J Pathol. 2011 Dec. 33(2):125-8. [Medline]. Myoepithelioma with an area of squamous metaplasia with keratin formation.